Located on a quiet street. This well maintained home has lots upgrades & features which include: fully finished basement, fenced back yard with deck, slate tiles, wood flooring, A/C, stainless steel frig, low maintenance backyard and much more. The main floor features a office/den, 2pc bath, laundry/ mud room off garage, spacious great room with fireplace, good size kitchen that offers a pantry, island with raised eating bar & a nook that has access to the deck/yard. The upper level features a 4pc bath, large bonus room & 3 good size bedrooms. The master bedroom offers a walk in closet & full en suite with soaker tub. The lower level offers a family room/ a games room, there is also storage space and a three piece bathroom. This home shows pride of ownership & has neutral colors throughout. Located only 25 min. 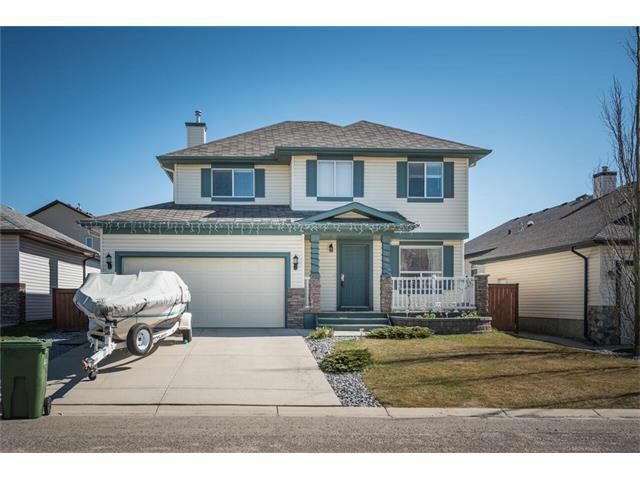 from Calgary downtown, Lake is a short distance & includes Boating, Fishing, Sailing & Skating in Winter, close to school, green spaces, shopping and all other amenities. Call today ! !